Starting and finishing in Atlanta, immerse yourself in the Deep South’s absorbing culture, music and food on our classic road trip. You’ll explore six of America’s southern states – home to blues, bbq, bourbon and more. Fly to Atlanta from the UK. You'll then collect your car at the airport and head northeast for a short drive to Atlanta’s answer to Central Park, Stone Mountain Park. Offering green spaces surrounding a huge quartz monzonite dome, this is the most scenic introduction to the city. Tomorrow, you’ll start your road trip with a cruise up to the beautiful Blue Ridge Mountains of North Carolina. Asheville in North Carolina's Blue Ridge Mountains is one of the most vibrant cities in the country. 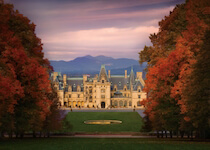 Filled with artistic architecture such as the Biltmore Estate, iconic landmarks and brimming with natural beauty. Venture further for the beautiful view from Chimney Rock which is approximately 25 miles away. Tomorrow you'll drive along the south section of the scenic Blue Ridge Parkway over to the spectacular Great Smoky Mountains National Park. Ridge upon ridge of pristine forest straddles the border between North Carolina and Tennessee in this super popular National Park. The Smokies are world-renowned for its diversity of plant and animal life, the beauty of its ancient mountains, and the quality of its remnants of Southern Appalachian mountain culture. Enjoy your second day exploring The Great Smoky Mountains. Look out for the wonderful wildlife living here. Black bears, bobcats, elk roam freely. The Great Smoky Mountains National Park is an awesome place to visit at any time of year, but in autumn the trees put on a spectacular show of colour for hikers and driving enthusiasts to enjoy. 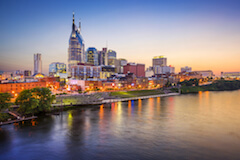 Country music takes the focus now as you’ll leave the Appalachian Mountains and head west to 'Music City', Nashville, Tennessee. En route you may want to stop at Dollywood Theme Park, named of course by its proprietor and local legend, Dolly Parton. The home of Country Music and proud of it. Nashville boasts about its music heritage at every opportunity, including the newly built Country Music Hall of Fame. However, it's not all about Country - there is a rich blues history here also and singer-songwriters from every genre enjoy playing the bars in this town. Tonight. for the full tourist experience, head down to Broadway and stop by a honky tonk or two for a one-of-a-kind night. Your Road Trip Pack will show you the most scenic route between these two great Tennessee towns. Alternatively, Elvis fans may prefer to head along Interstate 40 in order to get to Graceland and Sun Studios in the shortest possible time before arriving in Memphis for your two night stop. Second, only to The White House, Elvis Presley’s Graceland is arguably the most iconic home in America. Memphis has plenty more to offer, including the legendary Sun Records studios and the moving National Civil Rights Museum. In our opinion, Memphis is the Barbecue capital of America so make sure you try a rib joint tonight. Your Road Trip Pack includes multiple route options for driving between musical Memphis and historic Natchez. Natchez itself lies upon a bluff above the Mississippi River with former Plantation Homes dotting your route. Depending on your arrival time in Natchez, try to include Emerald Mound and Grand Village to learn more about the area's rich Native American heritage. Follow the Great River Road down to New Orleans, or 'The Big Easy'. Built on the mouth of the Mississippi River, the city has seen a lot of changes in the last 10 years and regeneration work is bringing out the best of its character. Oak Alley Plantation is nearby and is a must-do. Built on the mouth of the Mississippi, New Orleans is the home of the blues, voodoo and the colourful craziness of Mardi Gras. 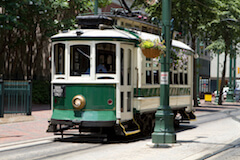 The French Quarter offers great charm and is an ideal place to lose the car and take a walking tour. other highlights include Audubon Park, Jackson Square, Bourbon Street and enjoying freshly made beignets at Cafe Du Monde. You’ve seen and done such a lot in last week and a half, from partying in New Orleans to hiking in the Great Smoky Mountains. So for the next two days, it’s time to just relax, hit the beach and top up that tan. Choose a different award-winning beach every day, or chill by the hotel pool. The Alabama border is just a few miles down the road, which helps explain the vibe of Pensacola, a city that jumbles laid-back Southern syrup with Florida brashness. Nearby St. George Island State Park, has been voted one of America’s top 10 beaches. The Gulf Islands National Seashore near Pensacola Beach is another coastal area offering turquoise waters, pristine white sands and adorable turtles. Today head back to Atlanta. Halfway along the drive lies Montgomery, here you can take a rest of driving and experience old southern charm and Civil Rights History. Atlanta is a growing city that exploded in size over the last two decades. Major visitor attractions include the World of Coca-Cola, CNN Museum, Piedmont Park and the gigantic Georgia Aquarium. Beyond the big-ticket downtown attractions, you'll find a constellation of superlative restaurants and iconic African American history. Tomorrow you'll fly back home to the UK, however if you'd like longer here we can certainly add in more time to explore this great city. 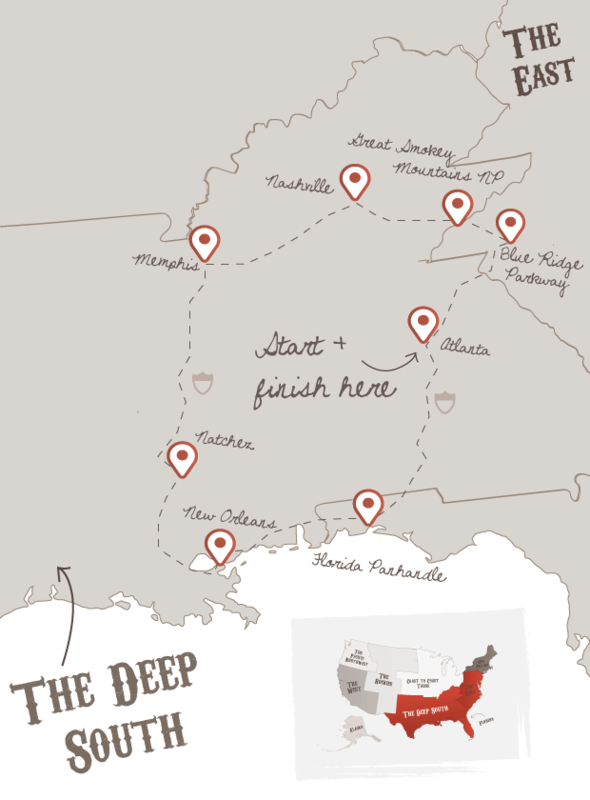 Don't forget to check out this road trip's Itinerary tab to see more amazing pictures from our 'Classic Deep South' tour. You'll also be able to read a little bit about what you'll be getting up to on each day of this incredible road trip adventure.